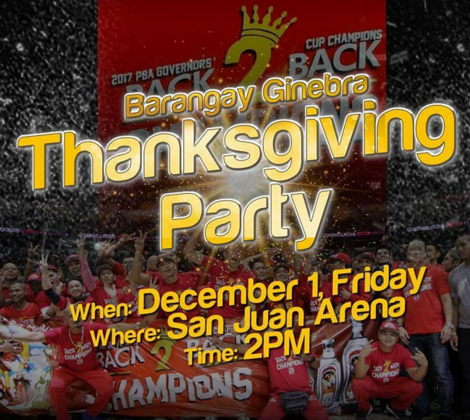 Ginebra Thanksgiving Party December 1: Time, Venue and other Details Here! The party never ends for the most famost ball club in the Philippines as Barangay Ginebra San Miguel aims to once again give back to its millions of fans tomorrow December 1, 2017 at the San Juan Arena. In line with the hashtag #GanadoSaBuhay that sparked the recent championship run of the team, the management and the players want to extend the Thanksgiving Vibe to their ever loyal fans. Get your groove on and jump to the beat of DJ Jet Baodo, Silent Sanctuary, and Itchyworms. A little reminder, the start of the program is at 2pm, but gates open at 11am so come as early as possible if you want to be one of the first 2,500 fans who will be given free official back-to-back championship shirts. To those who are not familiar to the venue, it's located in Brgy. Corazon De Jesus, San Juan City (along Santolan Road). It's known as the venue of NCAA and UAAP Games. You can get there via many routes. One of the my favorite route is through the LRT Line 2. Get down at either J. Ruiz or V. Mapa station. From there you can ride a trike or bus en route to the San Juan Arena.